Moody's has warned it may downgrade the credit rating of Spanish government bonds, saying last week's second rescue package for Greece had done little to ease debt concerns in the eurozone. The rating agency said it was reviewing Spain's current Aa2 grade, adding that if it was downgraded, it would probably be by just one level, to Aa3. 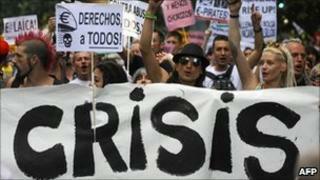 Moody's added that the Spanish economy remained "subdued". The Spanish government has now called an early general election. The announcement was made just hours after Moody's made its credit rating warning, and will see Spain go to the polls on 20 November. Explaining the decision, Prime Minister Jose Luis Rodriguez Zapatero said he wished to "project political and economic certainty" over the months ahead. However, it could be benefit the opposition conservative Popular Party, as it is ahead of the ruling Socialist Party in the polls. The government could have waited until March of next year to hold the general election. In explaining why it was reviewing Spain's credit rating, Moody's highlighted the fact that as part of the second bail-out deal for Greece, private bondholders were being invited to participate. This is another blow to Spain - anxious to convince investors it won't need a Greek-style bailout. But Moody's still has concerns, so it has put Spain on review, for what's likely to be a one-notch downgrade of its government debt. The ratings agency points to the slow pace of economic growth here, and the high levels of debt in Spain's autonomous regions. They account for almost half of state spending and several warn they'll overshoot the budget deficit target set by Madrid. The Prime Minister, Jose Luis Rodriguez Zapatero, has insisted that won't affect his target of cutting Spain's overall deficit to 6% by the end of the year. But investor doubts, coupled with concern over the details of the latest bailout for Greece, has already pushed Spain's borrowing costs higher and higher. The Prime Minister has now announced an early general election for November; the main opposition party has long insisted a change of government is the only way to recover confidence in this economy. The private bondholders, such as banks, are being asked to exchange their current Greek bonds for ones which pay a lower rate of interest over a longer term. Moody's said this set a "precedent", adding that it had "signalled a clear shift in risk for bondholders of countries with high debt burdens or large budget deficits". However, if Spain is downgraded to Aa3, this remains a healthy investment grade. Moody's also said five Spanish banks could have their credit ratings downgraded because of the same concerns. These include the largest two lenders, Banco Santander and Banco Bilbao Vizcaya Argentaria (BBVA). Despite the forthcoming general election campaign, Spain's central government is continuing to enforce cost-cutting efforts to reduce its public deficit. However, Madrid is hampered by the fact that Spain is a heavily devolved country, and its regional governments, such as those in Catalonia and the Basque region, are not moving as fast or as deep in trimming their spending. Moody's highlighted this problem, warning of "fiscal slippage" at the regional and local government level. Spain is also struggling with the eurozone's highest unemployment rate, which now stands at 20.9%. Spain's main share index was down 0.7% in afternoon trading, after falling as much as 2.4% immediately following Moody's announcement. The yield on the Spanish government's 10-year bonds rose 10 percentage points to 6.10%. The euro declined, falling 0.3% against the dollar to $1.4287. "The trigger is that the [Greek] deal last week has not really rebuilt confidence across the eurozone, so Spain is still on their radar screens with costs rising," said Giada Giani, analyst at Citigroup.